xxxx BMW Z4 3.0Si | 6-Speed Manual Transmission | Jet Black with Black Leather Interior | Named a Consumer Guide 'Recommended Buy,' the BMW Z4 was named on Edmund's Editors' 'Most Wanted Convertibles' List. It was awarded perfect 5-Star safety ratings, in every category, from the NHTSA, and Motor Trend calls it, ''basic excellence.'' Automobile reports the Z4 ''is, in a word, gorgeous,'' and Road & Track reports ''BMW put some real life into this sporty 2-seater.'' They also credit the Z4 with ''stiffer suspension, wider wheels, sport seats and a more aggressive exterior look.'' New Car Test Drive says, ''the Z4 is a blast to drive,'' and ''offers sharp handling that is the match for anything on the road.'' 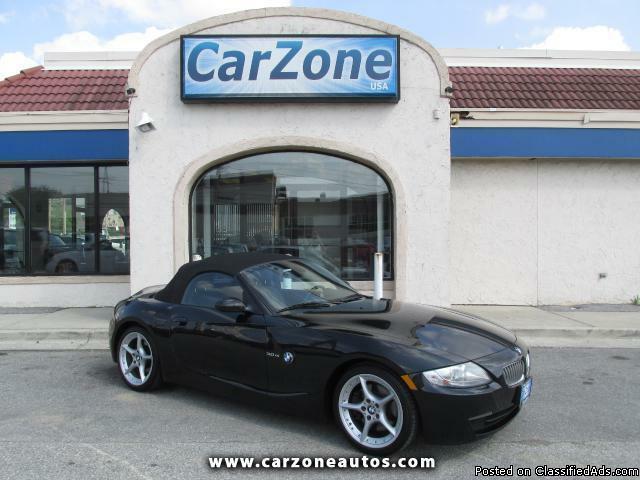 With a soft-top power roof, leather heated seats, automatic climate control, CD player with auxiliary Mp3 input, and a slick-shifting 6-speed transmission, the Z4 offers almost 260 horsepower of pure performance and fun! A great car to enjoy the summer with!